Wood was also used to replace materials deemed vital for the war effort, with metal cutlery replaced with wooden alternatives, and even clothes were made from wood. Chainsaws were invaluable in World War Two, but they did not resemble the chainsaws we have today. Chainsaws of the period were two-man machines and were used heavily by the Wehrmacht to build field fortifications. They also played an important role in increasing timber production for the US war effort. 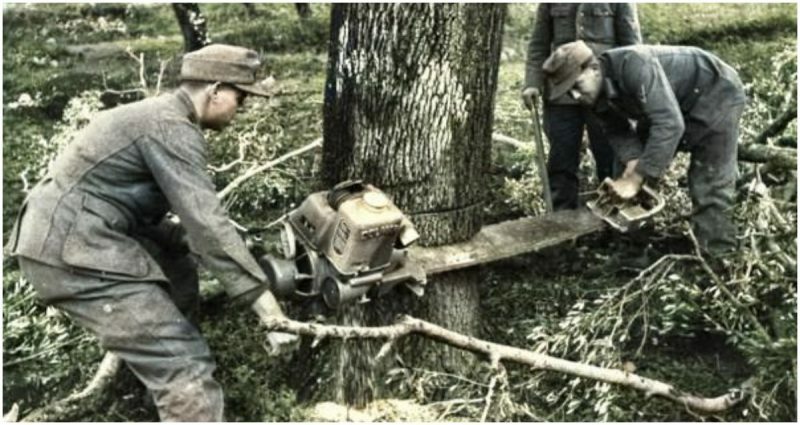 As was the case with a lot of technology in World War Two, the Germans led the way with chainsaws. 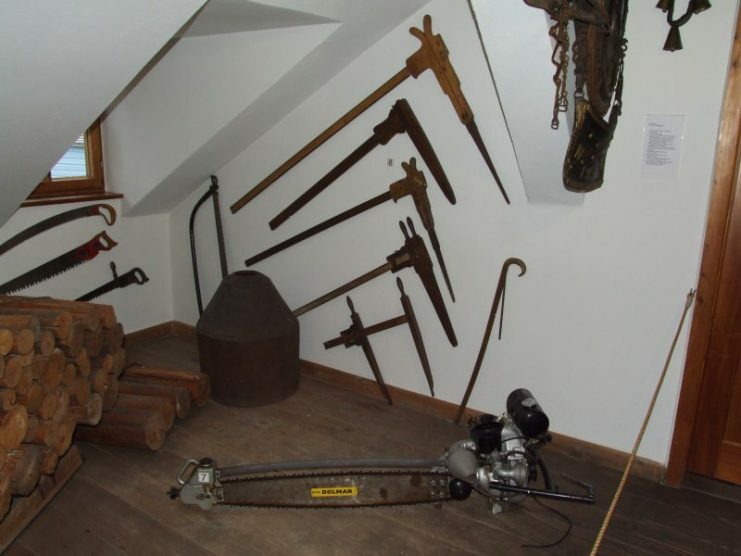 Early hand-driven chainsaws were first developed by doctors for cutting bone in the late 1800’s, but the Germans developed them for use in forestry. In 1926, German Andreas Stihl patented an electric two-person tree trimmer chainsaw. It weighed 106 pounds and had about 3 horsepower. 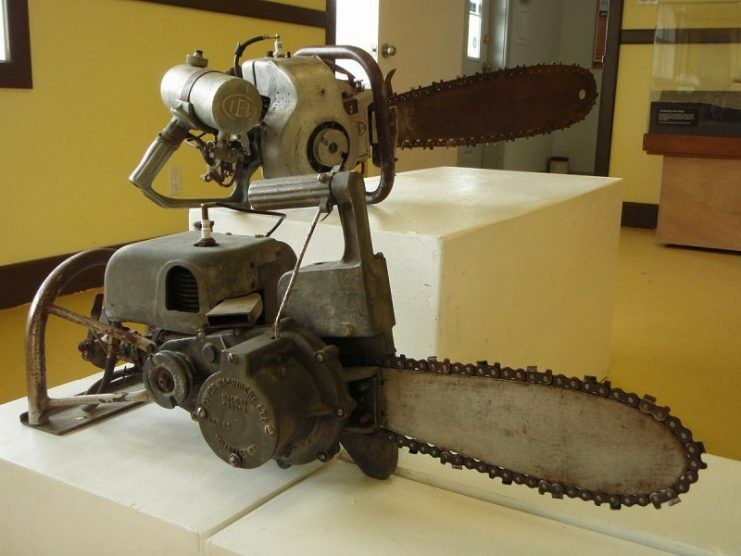 Then in 1927, a German company called Dolmar developed a two-person petrol-powered chainsaw, the “Type A”. Later in 1929, Stihl also developed a petrol-powered chainsaw that was designed to fell trees, weighing 101 pounds and with 6 horsepower. 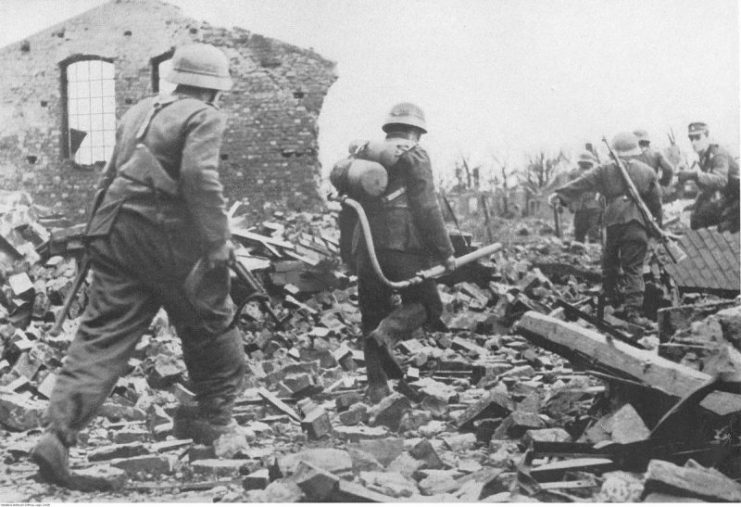 The Stihl model was the type that US servicemen first encountered and brought back to the USA. Further advancements made by Stihl included the 3-lug chain in 1932 and the centrifugal clutch in 1936. In 1943, Stihl released their most advanced model of the war, the 8 horsepower KS 43 “power saw” which was partly made with die-cast magnesium to reduce its weight to 79 pounds. These chainsaws were operated by two people due to their weight and size. One person held the engine while the other held a small handle near the end of the chainsaw blade. The chainsaws had to be operated in a fixed orientation since the carburetors were fixed. It wasn’t until after the war that carburetors with swivel and floating diaphragms were invented, which allow modern chainsaws to be used in any direction without flooding or starving the engine of fuel. Lighter materials were also essential to the development of the modern hand-held chainsaw. Felled trees and earth were key materials used by the Wehrmacht for their field fortifications. Timber was used to to construct barbed-wire and wooden fences, create embankments, and reinforce trenches and dugouts. Trees were typically readily available and only required felling to be useful. 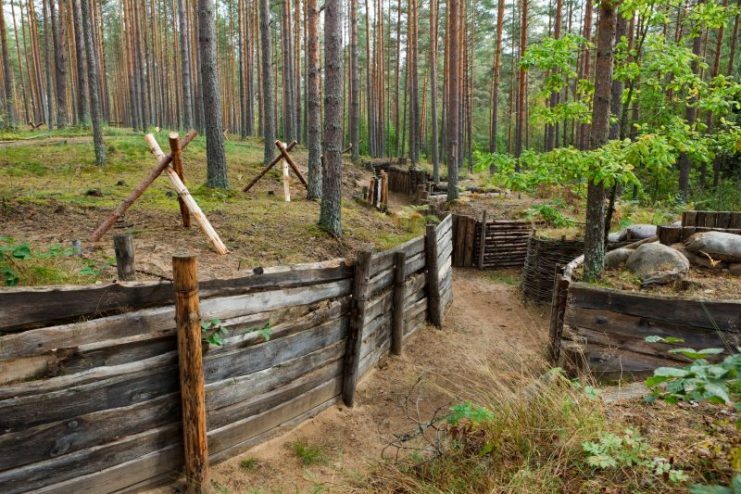 When the Germans had momentum in the early stages of the war, their field fortifications were minimal and little wood was required. These installations usually comprised of a single guard posts around key installations like towns, railway stations, and communication facilities. 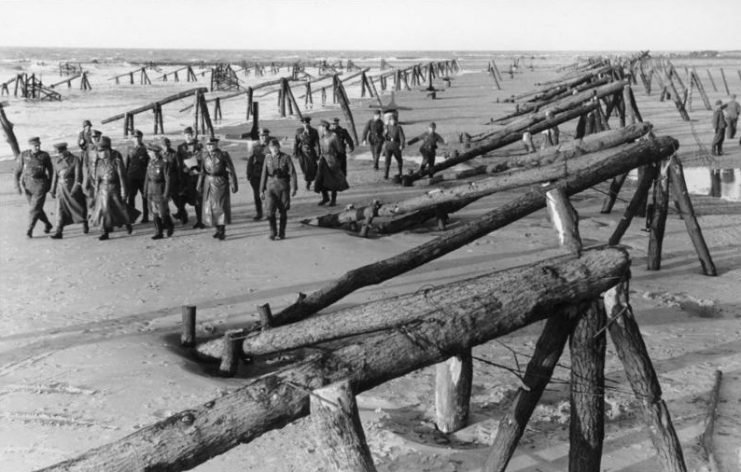 France,Belgium – Field Marshal Erwin Rommel with officers on inspection of wooden barriers on the beach before the Atlantic Wall, April 1944. However, from the winter of 1941-42 onward the Germans built more serious fortifications as the Russians began to counter. They began fortifying strong points at key strategic locations in the natural terrain, such as on hills. These strong points were connected with between one and three lines of trenches with dugouts for troops and supplies. In the rear, the trenches were supported by roads to make accelerate resupply and reinforcements. In 1943, as Stalingrad fell and the Battle of Kursk was lost, the Germans grew more strategic about their defenses and this was reflected in the design of their field fortifications. The fortifications became more elaborate, with a focus on creating a system of fire from different vantage points and using different types of weapons. Increasing German field fortification construction between 1941 to 1943 greatly increased the demand for wood. The advent of the KS 43 chainsaw greatly helped with this and was widely used on the eastern front. US serviceman first encountered the German chainsaws when they entered the war and returned examples to the USA to be copied. 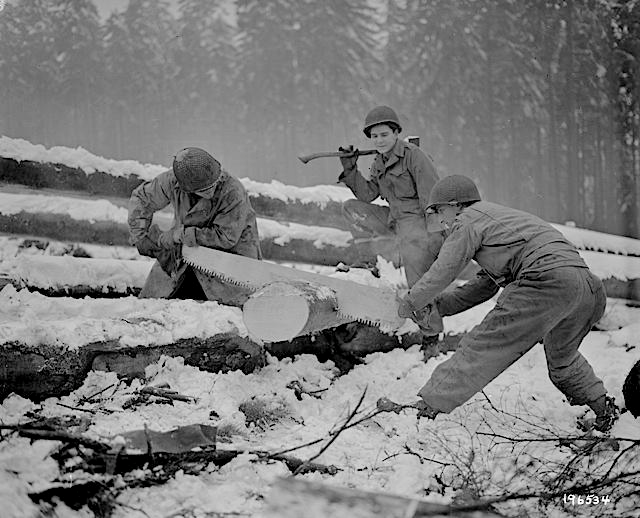 German-style chainsaws became essential in helping supply the US war effort with wood, particularly from the forests in the US northwest. During the Great Depression, the American lumber industry had contracted, so when timber demand soared with the advent of the US joining the war the new generation of chainsaws was a god-send. Chainsaws use was rare before the war, but now they soon became widespread. Demand for wood was driven by the need to build ships, planes, crates, barracks, hangars, and in small arms such as the M-1 Garand. Wood was also used to replace materials deemed vital for the war effort, with metal cutlery replaced with wooden alternatives, and even clothes were made from wood. In addition, firewood was rationed and a 1942 US propaganda film released by the US Department of Agriculture called “Wood for War” urged citizens not to avoid wasting wood. Kiekhaefer Mercury (since renamed Mercury Marine) was one of the first American companies to copy the German chainsaws. Mercury used their expertise constructing small motors to replicate and improve on the German chainsaws. Other US companies began building chainsaws, including Outboard Marine Corporation and McCullolch. The new American chainsaws were lighter and more powerful than their German counterparts, but they were still large and required a crew of two. It was not until several years after the war that the first one-man chainsaw was released, a single cylinder 38 pound chainsaw made by McCullolch.